The 30-year treasury hit another all time low yield last week. The 30 year treasury closed with a 2.25% yield last Friday. Daily Treasury Yield Curve Rates That long bond is hitting record lows regularly now. The government reported that real GDP increased 2.6% in the 4th quarter. News Release: Gross Domestic Product This is the first estimate for that quarter. Real personal consumption expenditures increased by 4.3%, up from 3.2% in the third quarter. Services increased by 3.7% compared to 2.5% in the prior quarter. Real disposable increased by 3.8% vs. +2%. The deceleration was mostly due to a strong upturn in imports (subtracted from GDP), a decrease in federal government spending, and lower nonresidential fixed investment. Excluding government spending and net exports, real GDP grew 3.9% (real private domestic final purchases). HCP raised its quarterly dividend to $.565 per share from $.545 or 3.7% on an annualized basis. At a total cost of $36.31, the yield becomes 6.22% at the new quarterly rate. Eurostat estimated that annual inflation decreased .6% in January. Energy costs decreased almost 9%. Company Description: Spirit Realty is an equity REIT that owns 2,100 properties across 48 states that are leased to 383 tenants operating in 18 different industries. The properties are "primarily" single tenant and are subject to triple net leases. The Yahoo Finance chart uses the adjusted price retroactive to the original IPO: SRC Interactive Stock Chart As shown in that chart, the share price as adjusted rose from $7.88 on 9/20/12 to $11.95 in May 2013, when there was a correction in REIT stocks that took the SRC price back down to $8.44 (mid-August). Since bottoming in August 2013, the shares have been in a general uptrend, with the last major dip occurring in September 2014. Over the past year through 1/28/15, SRC had outperformed SPY on a price basis, rising 20.36% vs. 13.35% for SPY, as shown in a 1 year comparison chart, Interactive Stock Chart. Rationale: I view this REIT stock to be slightly overvalued at $12.78 per share. It would be undervalued based on a 10 year treasury yield remaining near 1.7% or lower. The stock would be more overvalued with the ten year yield moving back over 3%. There has been a tight correlation between REIT prices and the then year treasury yields. REITs plummeted in value when the ten year treasury went from 1.66% (5/1/13) to 3.04% (12/31/13). When rates steadily moved down last year, REITs had a robust up year with the Vanguard REIT ETF posting a total return of 30.29% based on net asset value. The consensus at the time of my purchase was for $.83 in 2015, which translated into a forward P/FFO of 12.9 at my $10.7 per share purchase price. The current consensus FFO estimate for 2015 is $.85 per share. SRC Analyst Estimates The forward P/E at a $12.78 price is about 15.04 which is a tad expensive for me. I am also becoming increasingly concerned about stretched valuations in the U.S. REIT sector that is reminiscent of the peak P/FFO ratios hit back in May 2013 before a substantial correction occurred in the space. That correction was due to both valuations and a spike in the 10 year treasury rate from 1.66% (5/1/13) to 3.04% at year end. I am not ruling out a repeat of that correction this year or in 2016, simply because the talking heads are calling for deflation everywhere until the end of days, with the ten year treasury falling to 1% or so. I call that type of low probability forecast the Japan Scenario. The surprise this year may be to the upside in rates. The triple net lease to a single tenant does provide more stability than other real estate business models. Bankruptcy of one of the larger tenants is always a matter of concern. A quick spike in rates can cause REITs to decline in price. Some investors will sell since they bought these securities as bond substitutes and other securities become more attractive to them. A rapid rise in rates can also pinch FFO, at least temporarily, particularly when the rise in rates is not caused by inflation. Rent increases will be frequently tied to CPI. In a rate rise caused by interest rate normalization, rather than an increase in inflation or inflation expectations, the REITs may ultimately suffer significant increases in financing costs that would not be offset by rises in property values and rents. The rise in rates in 2013 occurred due to the rate normalization process. Inflation and inflation expectations were drifting down. Company Description: Apollo Global Management LLC Cl A (APO) is a global alternative asset manager. Operations are divided into several segments including private equity and credit segments. Rationale: The Old Geezer started to get the shakes about a potential market correction in the offing and relieved the stress and anxiety a smidgen by selling out of APO. Besides, Masters of Disaster and overpaid Wall Street Wizards make the OG nervous. The OG felt more comfortable buying the following stock, which has that nice dog snoopy as the brand ambassador for the company. The OG has always been a dog person. On the next trading day, MET fell $1.29 to close at $46.84, near its 52 week low of $46.15. Volume was heavier than normal at 10.9+M shares compared to a three month daily average of 6.6+M. Company Description: MetLife Inc. (MET ) is a well known provider of insurance and financial services. It is the largest life insurer in the U.S by total assets and provides group life insurance to 90 of the Fortune 100. In recent years, the company has been expanding to international markets and expanding its business lines beyond life insurance. Earnings from international market have risen to about 35% of the total. Morningstar estimates that income from retirement and asset management businesses will rise at a combined 8% compound annual growth rate in the "front end" of its projection period and at 6% in the "back end". This stock does not qualify under my dividend growth strategy. Item # 6 Stocks, Bonds & Politics Common Stock Dividend Growth vs. Long Term Investment Grade Bonds The dividend yield at my purchase price is below 3%, and dividend growth is slow and spotty. Prior to reverting to a quarterly dividend, MET paid out $.74 per share annually starting in 2007 and ending in 2012. It does qualify under my Large Cap Valuation Strategy based on the data cited below. I view it to be better for a stock to qualify under both. Barrons published an article on Saturday 5/8/14 titled "MetLife on Sale for Peanuts". MET closed at $53.14 the previous Friday. MET Historical Prices I would agree with the observations made by Andrew Bary in that article, but Mr. Market has nonetheless reached a different opinion judging by the subsequent share price action. S & P currently has a 4 star rating on MET's stock, with a $60 twelve month price target. For the reasons discussed in the risk section, I seriously doubt MET's stock price will hit that level until interest rates move back up to more historically normal levels. From September 2002 to October 2007, the stock rose around $21 to over $70, which works for me. Then the nasty happened and the price cascaded down to around $12.25 (3/09). Now, that had to hurt for a long time holder. At a total cost of $48.89 per share, the dividend yield is currently about 2.86%. Recent Earnings Report: For the 2014 third quarter, MET reported operating earnings available to common shareholders of $1.8B or $1.6 per share, up from $1.34 per share in the 2013 third quarter. Book value per share was reported at $61.44. The tangible common shareholders book value was $39.95 per share. Operating earnings in the Americas rose 14%. Operating earnings in Asia ($306M) increased 19%. Operating earnings for Latin Americas were $152M, up 14% on a reported basis and 22% on a constant currency basis. Total operating revenues increased to $17.918B from $16.814B. Return on equity was 12.1%. Rationale: The dividend yield provides some support for the share price and is above the current yield of 1.68% for the ten year treasury. The dividend yield at last Friday's closing price ($46.5) was about 3%. The stock would not qualify for purchase under my dividend growth strategy, even at a 3+% yield, due to MET keeping the dividend static at a $.74 annual rate for 6 years. Given the current TTM P/E and the forward P/E based on the consensus 2015 estimate, MET shares did not appear to me to have limited downside risk (possibly as much as $8 per share), barring a currently unforeseen development like a repeat of the Near Depression period. The TTM P/E multiple was about 9.51 based on last Friday's closing price, which is less than 1/2 of the current TTM P/E of 19.79 for the S & P 500 as calculated by Birinyi Associates, P/Es and Yields on Major Indexes-WSJ.com. I arrived at that downside price by looking at the 5/1/13 close when the U.S. 10 year treasury was at 1.66%, which is about where the yield is now. The one year stock chart supported this view that $48 was a price point where the shares found support for a bounce, though the previous share rallies have petered out around $56. That snapshot was taken on the day of purchase. The shares closed last Friday (1/30/15) at $46.5. So much for the $48 support. I have started to reinvest the dividend as a means to average down. I will likely continue doing so until the price exceeds $60 per share. I will then reconsider based on the then existing circumstances. With low interest rates trending lower, that has led to investment gains for securities owned by a life insurance company. The downside is premiums being collected are invested in securities that provide lower yields than the existing ones in the portfolio, unless the insurer takes on more risk for the same income generation. The situation is aggravated by higher yielding securities maturing. Interest rate risk exposure increases significantly, and unhedged losses from the investment portfolio would be large, just by a return to normal rates. When interest rates were rising between May 1, 2013 and December 31, 2013, sectors viewed as beneficiaries of higher rates performed better than the S & P 500 which had a robust up year. For example, many investors believe that regional banks will be net beneficiaries from rising rates, due to an expansion of their net interest margins. The SPDR S&P Regional Banking ETF (KRE) had a total return, based on net asset value, of 47.34% in 2013. I am not aware of an ETF that focuses just on life insurance stocks. The PowerShares KBW Insurance ETF (KBWI), which includes property and casualty insurance companies, had a 2013 total return of 55.64% based on NAV. MET closed at $38.14 on 5/1/13 and at $53.92 on 12/31/13, or about a 41.37% price again. The ten year treasury rose from a 1.66% to a 3.04% yield during that time period. Daily Treasury Yield Curve Rates That would confirm that investors view this company as a beneficiary in a rising interest rate scenario. The perception now, generated by the Bond Ghouls, is that abnormally low interest rates will remain until the end of days, as reflected in their pricing of a 30 year treasury bond to generate a 2.25% yield, as of 1/30/15. While it is just my opinion, the Bond Ghouls have lost their marbles. What we are seeing now is the bond market equivalent of stocks in 1999. The absurdity of the long term yields may not become apparent this year or even next year. It will become clear. Inflation is not dead, but just taking a bit of a nap. Time will tell whether those long term current yields will be worthwhile investments. To work out, they would require prolonged periods of deflation punctuated by periods of abnormally to generate a real return, or possibly a long period of serious Great Depression type deflation numbers followed by normal inflation numbers. At the moment, the herd believes in the predictions being made in the bond market and by a large number of talking heads who are bond managers and want to convince investors to swap out of stocks for those "juicy" bond yields. If their ominous predictions prove prescient, for a change, then MET's stock will likely remain under downside pressure, which is why I am putting this discussion in the risk section. MetLife may even be hurting the current share price some by making a big stink on the designation, making some investors believe it is some kind of disaster to future profitability. I agree with MET's position, but doubt that the courts will second guess the government's designation. MET is simply being penalized for the bad behavior of AIG outside of its standard insurance operations which remained sound throughout the Near Depression period. AIG's problems originated from the cowboys in its London special products unit. The actions of those individuals are described in some detail in a 2008 article published by the NYT and titled "Behind Insurer’s Crisis, Blind Eye to a Web of Risk". The future direction of interest rates is far more important than this issue. Future Buys and Sells: I may buy up to another 100 shares, possibly in smaller lots than 50 shares. I would only average down when a subsequent buy lowers my average cost per share. I may buy 30 shares in an IRA. I have currently a $10,000 limit on my out-of-pocket exposure to the securities from one company. That is a risk mitigation rule. I may elect to sell my highest costs shares bought first when and if the price returns to $55, provided I have bought another 30 to 60 shares at a lower price than the close last Friday. I infrequently update this part of my portfolio since it has been downsized substantially due primarily to redemptions or to bonds reaching maturity (primarily Citigroup Funding "principal protected" senior unsecured notes). I have also engaged in a fair amount of profit taking, including frequent trading of some securities. At one time, the exchange traded bonds and preferred stock segment of my portfolio was close to a $150,000 market value, and this allocation is now hovering near $60,000. I thought that today was a good one to update the list since this segment rose in value and consequently provided a much needed ballast to the stock market's decline. These securities did what they were supposed to do on a big down day for stocks. Overall, my portfolio design accomplished its objective today, with my main taxable account declining just .13%. Stocks, Bonds & Politics: Portfolio Management Goals-Snapshots of Performance Numbers YTD, 3 and 5 Years Cumulative I also had a number of sectors besides bonds rise in price. 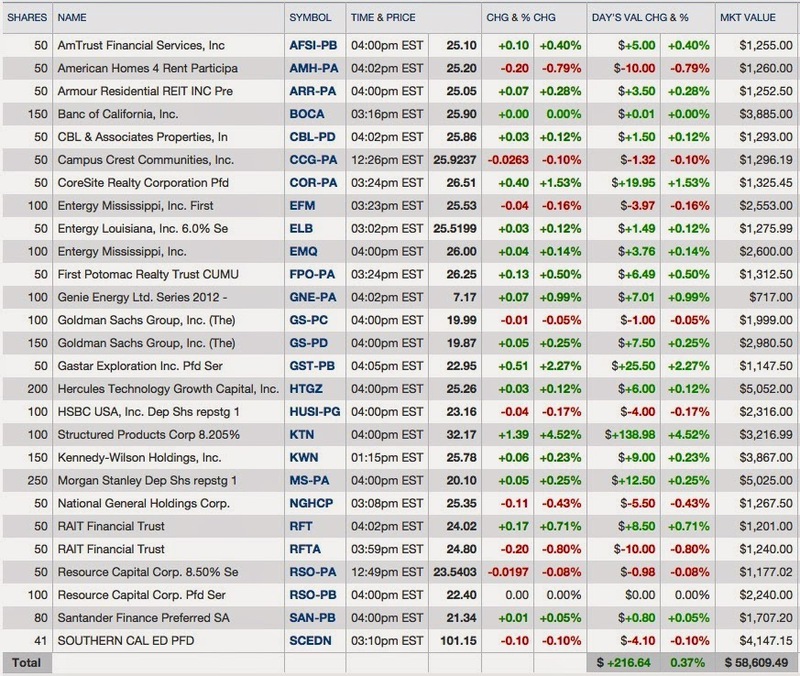 The REIT basket, for example, was net green today. I also maintain a large percentage cash allocation which has grown from about 20% to 25% over the past several months. I deployed some of that cash today. The last update was probably in February 2014: Stocks, Bonds & Politics: Updated Exchange Traded Bonds and Preferred Stock Table as of 2/10/14 Since that update, I have lost several securities to issuer redemptions and have sold others in a periodic profit taking cleansing process. As noted in the Gateway Post for Trust Certificates, that niche segment was considerably mispriced in 2008-2009. Those last two linked posts contains snapshots of profits and losses. My losses have been immaterial to date. I am not including ETNs in the foregoing list, even though those instruments are senior unsecured notes. I currently own the following ETNs: 50 AMJ, 40 BDCL and 100 MLPG. My REIT equity preferred dispositions since September 2013 can be found in this post, along with snapshots of the profits from those trades: Stocks, Bonds & Politics: Gateway Post: Equity REIT Common and Preferred Stock Basket I did buy a number of them in small 50 share lots after their prices were smashed during the rise in interest rates during 2013. Several of the positions listed in the latest table are vintage. My average cost for the Trust Certficate KTN is around $14 from the Near Depression period. TRUST CERTIFICATE AON BOND KTN ORDER FILLED 100 shares at $13.1 (October 2008 Post); KTN add at less than $14 November 2008; Sold 50 of 150 KTN at $28.17 (September 2010 Post) Most of my trust certificates were redeemed by the owners of the call warrants attached to those certificates. The stock market is having one of its bad days today, apparently surprised that the USD's strength was going to negatively impact U.S. multinational's earnings and revenues. That is hardly a news flash given that most major currencies have fallen close to 20% in value against the USD over the past 6 months or so. The Shiller home price indexes for both the 10 and 20 cities continued to show slower growth. In November 2014, the 20 city composite index was up 4.3% Y-O-Y, down from +4.5% in October Y-O-Y. The reinvestment price was $10.65+ which includes a 5% discount. In a family's members account at another brokerage company, the reinvestment price was $11.263 per share. Those shares were bought in the market, probably on 1/15/15 at the opening when the price was $11.26. By buying the shares in the market rather than through LXP's dividend reinvestment plan, the family member did not receive the discount. The timing of the share purchase would also be different. Security Description: The Lexington Realty Trust (LXP) is a self-administered equity REIT that "owns a diversified portfolio of equity and debt interests in single-tenant commercial properties and land". All of the land leases and a majority of its properties are subject to net leases, where the "tenant bears all or substantially all of the operating costs". When transitioning a position, I want to sell the shares being transitioned for a profit and to buy the shares the other account at a lower price. Rationale: In my Vanguard Roth IRA, I do not receive a 5% discount on the reinvestment price. A 5% differential on $11 is after all $.55 and that will add up over time, both in terms of the shares bought with the dividend and the shares bought with the dividends paid by shares bought with the dividends. In a comment to a recent Seeking Alpha article, I noted that LXP was expected to show negative Y-O-Y FFO between 2014-2015, and that the Funds Available for Distribution (FAD) were well below the FFO and AFFO per share numbers. Until LXP can consistently grow FFO in the low single digits, at a minimum, the P/FFO will remain significantly below other REITs in LXP's sector. Future Buys in Fidelity Roth IRA: When and if I can lower my average cost per share, I will buy another 50 shares in the Fidelity Roth IRA. Currently, the average cost per share is $10.58. The ordinary shares are traded in Stockholm and priced in Swedish Krona (hereinafter SEK). Company Description: Swedbank AB ADR (SWDBY) is the largest bank in Sweden and has an extensive presence in the three Baltic countries of Estonia, Latvia, Lithuania. This bank has 318 branches in Sweden and 170 in the Baltic countries. 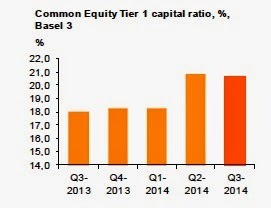 Dividends: Swedbank pays an annual dividend in SEKs that will be converted into USDs for the owners of the ADR SWDBY. The amount of the dividend will consequently depend on the exchange rate at the time of conversion. The dividend was eliminated in 2008 and 2009 after growing nicely up to 2007. The bank paid out SEK9.9 per share for its last annual dividend, up from SEK 5.3. The company has not yet declared the dividend rate for 2014 that will go ex dividend later this year. Given the uncertainty on the amount and the currency conversion rate, I can not estimate a dividend yield. If I assumed the SEK9.9 rate, converted that amount as of 1/23/15 into USDs, then the yield would be about 5.16% at a total cost of $23.25. I have my doubts that the bank will continue at a historically high payout ratio. Foreign Withholding Taxes: I will use the Deloitte website to determine the tax treaty dividend withholding rates. Treaty Rates | Deloitte I simply check "United States" in the left hand side box, click "active" in step 2, and "dividends" in step 3. I then look for the applicable foreign country. I see that Sweden will withhold 15%. For the U.S. tax treaty with Sweden, I noted that Article 10 did provide for a 15% rate. I will not buy a foreign dividend paying security in an IRA when there is a withholding tax. I will buy a foreign dividend paying stock in an IRA where no tax is withheld. No recovery of the foreign tax is permitted when the dividend is paid into an IRA. A foreign tax credit can be claimed only when the dividend is paid into a taxable account. The rules governing foreign tax credits are explained in a Schwab publication: Claiming Foreign Taxes: Credit or Deduction? I am certainly no expert on the subject. Rationale: Swedbank appears to be a prudently managed bank whose share price has some dividend support. The capital ratios are excellent. The ADR price has already been smashed a lot due to the weakness in the SEK vs. the USD. While that downslide may continue, the SEK's value is already near a 10 year low, so a lot of the currency risk in existence as of last May has been drained out of the risk equation, thereby increasing the potential long term currency exchange benefit. Risks: An important risk after purchase involves currency exchange rates. A continued decline in the SEK's value versus the USD will have a negative impact on the pricing of the ADR. I am not concerned about the bank's capital ratios. However, a recession can eat into that capital and cause a bank to cut the dividend. While this bank did eliminate its payout for two consecutive years, it has recovered back to the pre-2008 dividend level much quicker than large U.S. banks. Still, I always view dividend cuts and eliminations with significant negativity. The fact that Swedbank has eliminated the dividend for two years place a dark cloud over its willingness to continue paying dividends when the going gets rough. I am also concerned about the stagnation in Europe generally and less so in the Nordic countries. Net interest margin compression is also a negative item for the foreseeable future. While it may be remote, a Russian military incursion into the Baltic states is a possibility, as Putin seeks to further expand Russia's border through military aggression. Future Buys/Sells: I will consider averaging down with another 50 lot purchase. 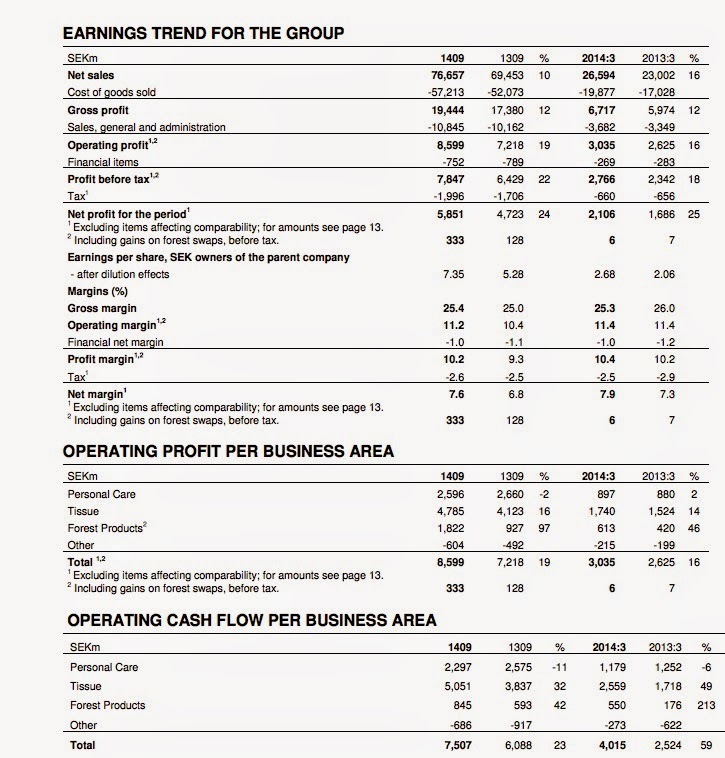 I first want to read the earnings report for the last quarter. I would also want a $1 per share lower price. I have no target price for selling the shares. If I average down with another 50 share purchase at less than $22.25, preferably closer to $22, then I would be more inclined to sell the highest cost lot on a pop in price and then hopefully buy the shares back when and if the purchase would lower my average cost per share. I bought the ADR traded on the U.S. pink sheet exchange and priced in USDs. Svenska Cellulosa AB (SVCBY) A pink sheet exchange symbol ending in a "Y" denotes an ADR. Company Description: Svenska Cellulosa AB ADS (SVCBY) is one of the world's largest personal care and hygiene companies. SCA is the largest private owner of forests in Europe, with approximately 2.6 million hectares of forest land (6.4M acres), and has a variety of forest products. Personal care and tissue products include diapers, toilet paper, wet wipes, soap, lotion and feminine care products. SCA is the second largest tissue producer in the world with about a 10% share of the consumer tissue market. In 2014, SCA transferred its hygiene business in China to Vinda International Holdings, a company listed on the Hong Kong exchange. SCA’s transfer of Chinese hygiene business to Vinda approved - SCA Corporate The purchase price was SEK 1,000M or HKD1,144M. Vinda's market capitalization is about HKD11.681B based on last Friday's closing price of HKD11.7. That translates into roughly USD1.5068B. Assuming no change in the 51.4% stake, the value of SCA's Vinda stake is about USD$774.5M. During 2014, SCA floated its Australian joint venture, Asaleo Care Ltd, and currently owns 32.5% after the IPO. Based on Asaleo's closing price from last Friday, that stake is worth about 330M Australian Dollars. Based on last Friday's closing price of SEK180, SCA's market capitalization is approximately SEK127.625B or USD$15.244B. Dividends: Dividends are paid annually in Swedish Krone and then converted into USDs for the owners of the ADR. The dividend yield will fluctuate based on the conversion rate. If the SEK continues to decline in value after my purchase, then the annual dividend will buy fewer USDs, and my dividend yield will consequently be negatively impacted by the SEK's weakness. The converse is also true. My dividend yield, based on my constant total cost number, will go up with a rise in the SEK after my purchase and with any dividend increases. The annual rate was SEK 4.4 in 2007, which was slashed to 3.5 in 2008. That is a profound differential, almost 18%, due solely to currency conversion from SEKs into USDs. While I will not hazard a guess when the USD will lose its current gusto, experience has taught me that the USD is far from a perpetually strong currency and other developed foreign currencies, including the SEK, will have their day in the sun when the darkness and clouds envelope the USD once again as in the past. I can wait for the worm to turn and for those blue and red lines to converge which recently happened with the USD priced Swiss ADRs. Hopefully the ordinary shares priced in SEKs will have gained in price when the USD falls in value back to buying around 6 SEKs (or thereabouts) rather than 8.34 or so now. While the USD may continue its parabolic moon shot against other developed country currencies, those type of events have a tendency to collapse upon themselves and are eventually self-correcting. The U.S. economy slows due in part to a strong currency while weaker currency nations enjoy an acceleration in growth. Inflationary pressures decrease for the stronger currency nation and increase for the weaker currency ones who later abandon abnormally low interest rates as inflation turns up with GDP growth and lower unemployment. A long term Dollar Index chart shows the ups and downs of the USDs value against a basket of six foreign currencies weighted in the Euro: DXY Index Chart The latest rise looks and smells like a typical parabola that will collapse. Recent Earnings Report: For the 2014 third quarter, SCA reported a net profit of SEK 2,106M or SEK2.68 per share, up from SEK 2.06 per share in the year ago third quarter. The 2014 E.P.S. for the nine month period was SEK 7.35, up from SEK 5.28 in the comparable nine month period in 2013. Rationale: Earnings and the dividend are both accelerating, and the valuation is reasonable for a consumer products company. The foothold in China through Vinda is another reason for this purchase. While that stake is currently worth about 5% of SCA's market capitalization, there is certainly growth potential in China and the Vinda investment could become far more valuable in the years to come. Other than dividend hiccup during the Near Depression, SCA is growing its dividend in the mid-single digits. Given the huge decline in the SEK's value vs. the USD, I have a long term potential for a currency gain in the ADR when the worm turns against the USD and it will sooner or later. I can afford to wait for that happen. Risks: As shown in the preceding chart comparing the ordinary and ADR share prices, currency risk is material. SCA faces formidable competitors including Proctor & Gamble and Kimberly Clark in its personal care and tissue product lines. The quality of those two competitors is a major headwind for SCA in my opinion. The publication paper business sector is in a long term secular decline. Some of the other forest products sold by the company are cyclical and more dependent on an economic recovery than the personal care and tissue products with relatively stable inelastic demand. Future Buys and Sells: I do not have a target price. When buying first a 50 share lot, I am anticipating the possibility of buying another 50 shares at a lower price. I will want a $1 per share lower price than my first purchase at $22.27 or a 4.5% to 5.5% share price decline. I received last Friday the shares purchased with this fund's 2014 year end distribution. SWZ closed at $11.41 last Friday, down $.11. The net asset value per share was $13.14, creating a discount to net asset value of -13.17%. 1. Added 50 PNNT at $8.2 (see Disclaimer): PNNT is being trashed due to its exposure to E & P loans. The shares traded in a broad range between $8.16 and $8.7. Volume was 2.376+M compared to an average of 540,040 over the prior three months. Security Description: PennantPark Investment (PNNT) is an externally managed BDC. The company estimated that its net asset value per share would be in the $10.4 to $10.5 range as of 12/31/14, down from $11.03 as of 9/30/14. The estimated quarterly net investment income was in the $.25 to $.27 range, slightly below the then consensus estimate of $.28. Those two items were the bad news. The somewhat positive news was that PNTT was "comfortable" with its energy investments given their "seniority", reserves and "substantial hedges". I assume that the reference to substantial hedges refers to the hedges that the E & P companies have in place. I am not comfortable with PNNT's exposure as noted below. The company also assured investors that it would not be selling stock at below net asset value per share, and that it "currently" intends to maintain the quarterly dividend at the $.28 per share rate. "Currently" is one of those meaningless words when used in that context. Lastly, the company noted that one of its portfolio companies had an IPO in the 4th quarter that will increase PNNT's net asset value by $.08 per share and result in a $.13 per share realized gain. That was real positive news. I believe that the portfolio company that had a 4th quarter IPO was Patriot National (PC). Since early in 2010, this stock has traded mostly in a narrow channel between $10 to $12 after crashing in 2008 and early 2009. PNNT Interactive Stock Chart The share price crashed below that range late last year due primarily, in my opinion, to its large exposure to energy companies. Between 4/19/2007 and 1/20/15, the annualized total return with dividends reinvested was +4.38%. Calculator That anemic total return, which includes reinvestment of dividends, clearly illustrates why this stock is not a worthwhile long term investment and needs to be traded to secure an adequate total return. The return also highlights that the reinvestment of dividends can result in the destruction of their original cash value. If I start that total return calculation on 1/2/2010, the PNNT annualized return increases to 8.86%. Starting the calculation on March 9, 2009 after the price had cratered to the low single digits, the annualized total return increases to 34.23%. A buy on 5/13/13 would have generated a -5.53% total return. In short, the total return numbers will also depend on when you buy and sell. A buyer on 3/9/2009 would have been better off selling on 5/13/13 rather than holding long term. The annualized return for that holding period was +55.03%. The external managers are paid 2% of gross assets plus a generous incentive fee. Other Prior Trades: The prior trades are summarized in Item # 2: Bought 100 PNNT at $10.66-Regular IRA This last purchase brings me up to 300 shares. I last sold PNNT when the market price was at a premium to NAV per share, viewed as substantial for an externally managed BDC in my opinion. Item # 5 Sold 50 PNNT at $11.92 (12/17/13 Post)(profit $71.68)- Item # 6 Bought 50 PNNT at $10.2-ROTH IRA (11/21/12 Post) When I sold that 50 share lot, the last reported net asset value per share was $10.49 as of 9/30/13, so an $11.92 market price was a 13.63% premium to that NAV number. Dividend: PNNT is currently paying a $.28 per share quarterly dividend. Assuming no change in that rate, which is certainly a questionable assumption, the dividend yield at a total cost per share of $8.2 is about 13.66%. Last Earnings Report: For its 4th fiscal quarter which ended on 9/30/14, PNNT reported core net investment income of $.34 per share. The net asset value per share was reported at $11.03. The weighted average yield on debt investments was 12.5% as of 9/30/14. Rationale: As with all BDCs, my goal is to harvest a 10% annualized total return and will generally consider doing so when and if I achieve that objective. I could achieve that annualized return by collecting 4 dividends and selling the shares at a loss. However, I am not likely to sell the PNNT shares for a loss unless I become spooked about this BDC's performance. The overriding goal is to harvest a total return in excess of the dividend yield. The current quarterly dividend is $.28 per share. At a total cost of $8.2 per share, and assuming a continuation of that rate which is not an assumption that I would make, the dividend yield would be about 13.66%. The general idea is to harvest that yield and to escape without losing money on the shares. Easier said than done is my motto for externally managed BDCs. As noted above, the company disclosed within an hour or so after my purchase that book value was likely to be in a range of $10.4 to $10.45 per share as of 12/31/14. I do not know the reason for the decline, but suspect that it involves some loan write-downs. If I take the low end of that guidance, then the $8.2 purchase was at a 21.15%% discount to a $10.4 per share net asset value. By buying at below the last reported net asset value per share, I simply improve my chances of getting out with a share loss. The December 2014 purchase was made at below net asset value too, but that did not help me any. My last purchase was at $10.47 about a month ago and the price had declined 21.68% when I purchased this 50 share lot at $8.2. PNNT is not a serial issuer of common stock like PSEC which unfortunately also has a history of selling shares before net asset value per share. BDCs invest in risky companies and do not retain much of a capital after paying dividends to their common shareholders. The shares will perform badly during a recession. Loans made by BDCs are generally not rated by Moody's or S & P. If the loans were rated, most of them would be at CCC+ or lower. An average portfolio yield of 12.5% adequately describes the risk when the ten year treasury is hovering around 1.8.%. The largest exposure appears to be a Ram Energy L.L.C. that PNNT classifies under "energy/utilities" rather than "oil and gas", even though this private company appears to be an E & P only. There is little public information available on this private company. Why is that company not classified under oil and gas that would bring the total exposure up to 17% from the 9% shown for the "oil and gas" category. The CEO was asked about that position in the Q & A and noted that PNNT "agonized" over it. He further noted the first lien status and that $27M of the exposure was in a 1 year maturity. Page 4 Earnings Call Transcript | Seeking Alpha My question after reading that exchange was how exactly is RAM going to raise funds now to pay off that one year loan. I would be curious to hear PNNT's explanation for the "energy/utilities" tag which fooled me for awhile. There is a company called Ram Energy, Inc. that is involved apparently in two foreign geothermal projects, but I see no factual reason to connect the two companies. Another large investment is the debt issued by New Gulf Resources, L.L.C., a company that closed on a $500M loan last May to buy some assets from Halcon Resources Corporation, which was formerly known as Ram Energy Resources, Inc.
That investment is shown as second lien debt with an 11.75% coupon with a value of $45.675M and a cost of $44.615+M as of 9/30/14 (page 61, 10-K) There is shown some subordinated debt at page 62, with a cost of 13.030+M and a value of $10.665M that looks like a 12% PIK note (which I call pretend interest payments, though the correct name is payment-in-kind) PNNT also owns some warrants (cost $495,000, valued at 2.97M as of 9/30/14, page 63) Second lien status for an E & P loan is worrisome. I would assume that the warrants have been written down in value. Another smaller E & P investment is in a company called Energy & Exploration Partners which filed for an IPO in September 2014. S-1, S-1/A The share symbol was shown as ENXP in the prospectus. I believe that this company is still private. The last few months have not been an opportune time to bring an E & P public. There is an amended S-1/A that was filed in December that provides useful information about this company (derivative contracts summarized at page 52 as of 12/4/14). It is difficult for me to see the shares gaining much upside traction until investors have more clarity on the potential E & P loan losses. Even if those investments went to a zero value today, however, the current market price would still be below the $10.4 to $10.5 estimate as of 12/31/14. Any investor buying shares now is catching a falling knife. Future Buys and Sells: I had previously asserted that I would not buy another share after bringing my position up to 300 shares. The spurt down to $8.2 caused me to move slightly off that dime. I do not intend to buy more shares at above $8.2, though I will consider buying another 50 share lot when and if the price slides to $7.5. I had hoped that most of the BDC weakness late this year was related to tax loss selling, but the selling pressure has continued unabated in 2015 particularly for those BDCs with greater than a 5% exposure to E & P companies. I hope to sell 100 shares either this year or next, when and if the market price per share returns to a premium to net asset value per share, provided I can sell at break-even or higher. The share price closed at $22.28. Regional banks performed well on the next trading after my purchase, with TRMK closing at $23.36, up $1.08 or 4.85%. The regional bank ETF KRE rose 4.5% that day in a robust rally. With interest rates falling last Friday, the regional banks were back into retreat mode. Company Description: Trustmark (TRMK) is a bank holding company that operates 207 branches through its wholly owned subsidiary Trustmark National Bank. TRMK is based in Jackson, MS.
TRMK has been active on the acquisition front, expanding its geographic footprint over the past several years. Two of the recent acquisitions are described at pages 93-94 of the 2013 Annual Report: (1) the 2011 FDIC assisted acquisition of the Heritage Banking Group, Carthage, Mississippi and (2) the 2012 purchase of Panama City's Bay Bank & Trust Co. Prior Trades: I have been in a trading mode for this stock, never buying more than 100 shares. My normal buy is just a 50 share lot. Dividend: The bank is currently paying a quarterly dividend of $.23 per share. Assuming a continuation of that rate and a total cost per share of $22.25 per share, the dividend yield would be about 4.09%. Prior to the Near Depression, Trustmark was raising its dividend rate annually. The quarterly rate was raised from $.085 per share in 1998 to $.23 per share in 2007 or 170.59% using an online percentage increase calculator. Last Earnings Report: For the 2014 third quarter, TRMK reported net income of $33.6M or $.50 per share. The net interest margin has been trending at over 4%, well above the current national average of 3.09%. That favorable is trend is mostly temporary and due to "accretion" of acquired loan discounts. When a bank acquires loans from another bank, the discount on acquired loans are marked to market value and the difference is accreted to net interest income and hence to net interest margin over the loan's life. TRMK is still receiving benefits to net interest income derived from its prior acquisitions. Net-Charge offs for the quarter to total loans was -.03%, indicating a net recovery. The 2014 third quarter average charge-off ratio for U.S. commercial banks was .45%. The allowance for loan losses to non-performing loans (coverage ratio) was at 79.41% as of 9/30/14. The non-performing loans to total loans (NPL ratio) was at 1.37%. Rationale: Trustmark is within a fair value range at my $22.25 purchase price and has good dividend support at that price. 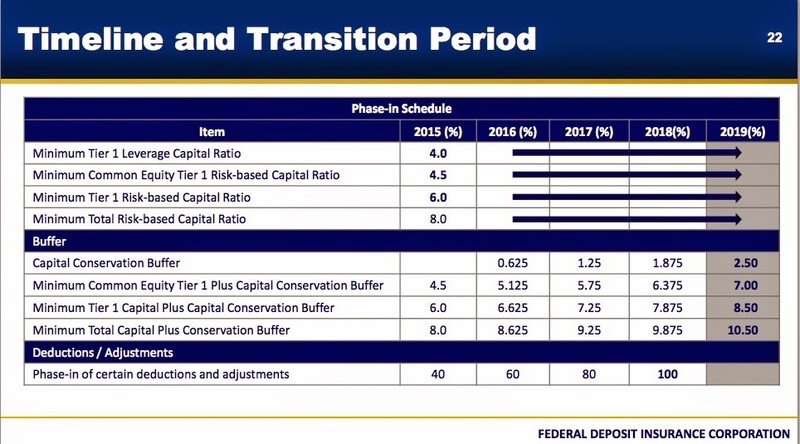 The capital ratios are good and net-charge offs have historically been below the average for commercial banks. Given that financial institutions were at the epicenter of the Near Depression, I view it as a positive when a bank, such as TRMK, was at least capable of maintaining it dividend and to cover that payout with net income. I do not like to see Masters of Disaster and Gunslingers running banks for their own personal aggrandizement. The foregoing data from 2007-2011 at least provides me with a yardstick to measure potential downside risk during a major recession, assuming the bank remains prudently managed in the future as during the last major economic downturn. 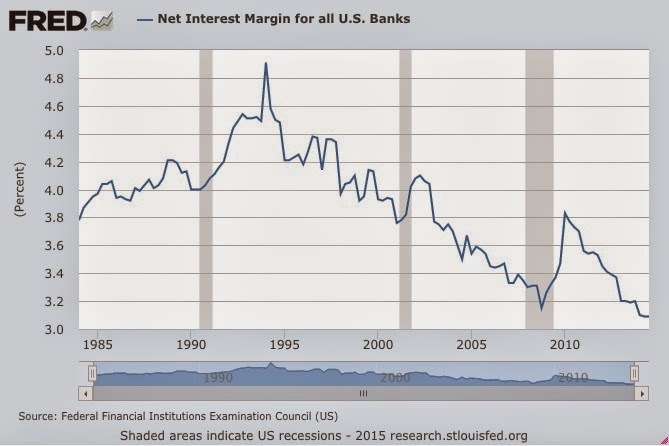 Risks: One of the key risks for all banks now is net interest margin compression. That risk can become more acute when and if the Federal Reserve starts to raise the federal funds rate, which will increase deposit costs, and there is no offsetting improvement in loan yields and/or yields on investments. Bank stocks will likely go down more in a recession than the S & P 500 or any other broad index. Even if net interest margin improves, the profit benefit can be overwhelmed by an increase in loan losses. In general, an investor wants to see an increase in loans and low cost deposits, lower loan losses due to an improving economy and an expansion of the net interest margin due to higher lower and investment yields. TRMK describes risks incident to its operations starting at page 16 of its 2013 Annual Report. Another negative is that the consensus E.P.S. forecast for 2015 is $1.72, down from $1.85 in 2014. That decline may be largely due to lower net interest income through loan accretion, which I discussed above. Future Buys and Sells: Until I see improvement in earnings growth and a dividend raise, I will be in a trading mode for this stock. I do not require much of a profit before selling out and then simply waiting for a downdraft to buy back. I sold my first lot in January 2012 at $24.7 and just bought back 50 shares in January 2015 at $22.25. The trading strategy seems appropriate looking at the stock history over the past five years and will likely remain in force until I see a reason to hold long term. I have not seen that reason materialize yet. I held the shares long enough to receive 3 monthly dividends ($.114 per share), with the last one scheduled for payment on 2/2/15. Security Description: The Nuveen Build America Bond Opportunity Fund (NBD) is a leveraged closed end bond fund that invests in taxable municipal bonds issued under the Build America Bond program. This bond CEF is scheduled to terminate on or around 12/31/2020, "distributing the fund's assets to shareholders at that time". The net asset value on the date of purchase was $23.89 and the discount based on the $21.36 closing price that day (11/3/14) was $21.36, creating a discount to net asset value at that time of -10.59%. The discount had shrunk by 2.64% since my purchase with the net asset value per share increasing 1.13% unadjusted for the three monthly ex dividends. As of 12/31/14, the fund owned 62 securities. The leveraged adjusted duration was then 11.94 years. Rational: I clipped three dividends and made a decent percentage return on the shares. I am holding the functionally equivalent NBB in the ROTH, at least for a few more weeks. While the bond ghouls are not concerned about interest rate risk, I seen almost nothing but that kind of risk in these long duration bonds and bond funds. The risk is so strong that it is blinding to even gaze upon it. TLT for example has a duration of 17.9 years and a distribution yield of 2.48% as of 1/21/15. iShares 20+ Year Treasury Bond ETF | TLT A 2% rise in interest rates for treasuries with similar maturities would result in about a 36% loss in TLT's value or roughly 14.4 years of dividend payments at a 2.48% yield. The duration is long, as noted above, so interest rate risk is high. A 1% rise in interest rates for similar duration bonds could result in almost a 12% decline in net asset value per share. I am consequently moving in and out of these long duration leveraged bond CEFs. Eventually, I may have no choice but to sell at a loss after buying back shares one too many times. Intermediate and long term rates fell last Friday.